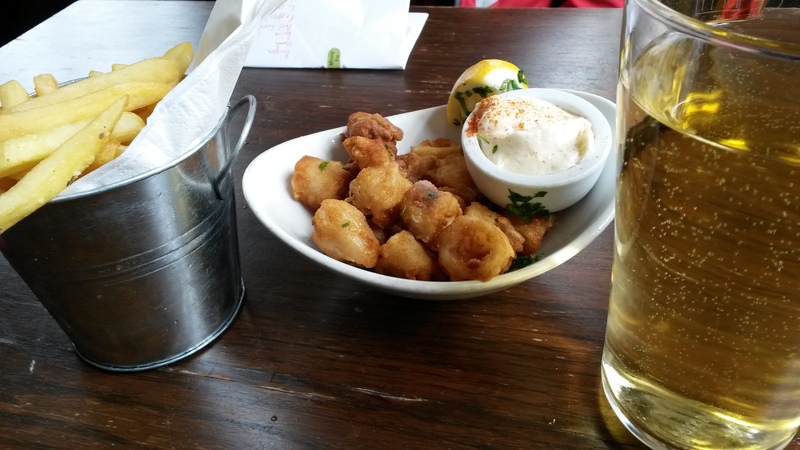 Recently we stumbled upon The Manor Bar and Grill on Tooting High Street. Prepare yourself for a really awful photo. The front looks much more inviting than my photo shows. We didn’t plan on hopping into a pub that day, but when I spied it, I decided, why not. It was a Friday afternoon and the place was nearly empty. That didn’t bother us one bit. Before we left our flat, I had lunch, but like I’ve said before, I’m usually hungry. So I ordered the lightly crisp chilli squid and some skinny fries. The squid was delicious and fresh. The fries were tasty. It was a somewhat warm day so I enjoyed a cider with my snack. Before leaving I noticed that they had desserts. When I pointed to the chocolate fondant with vanilla ice cream the better half didn’t say anything and went to the bar and ordered another round of drinks and my dessert. The other day, we were in the same neighborhood and we popped into The Manor again. 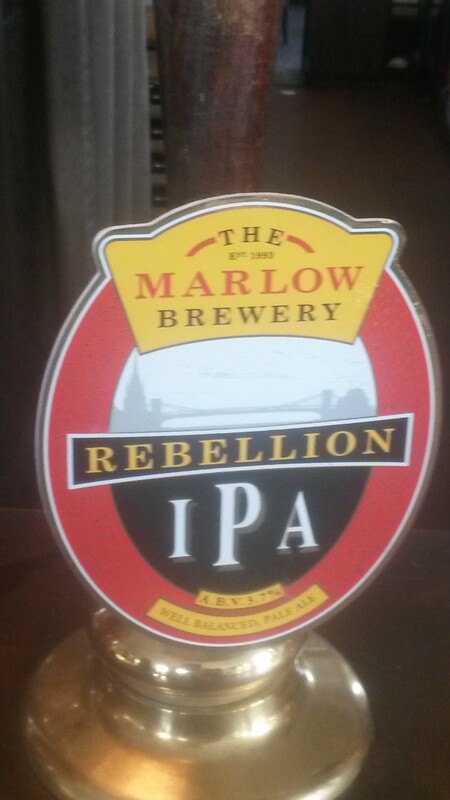 This time I sampled the Rebellion IPA crafted by The Marlow Brewery, but skipped having food. Not sure why, but I think I had a reason. The IPA had a nutty and fruit flavor and to be honest, went down easily. I was expecting it to have a stronger hoppy taste and was glad it didn’t. Here comes another horrible photo. Each time we’ve been there, we’ve enjoyed the laid-back atmosphere. We haven’t been there in the evenings so I’m not sure how crowded it gets. If you’re in the area during the afternoon, I highly recommend it. And the chocolate fondant was pretty darn good. We have an extremely busy weekend planned so the chances of us finding a new pub this weekend is pretty much nil. Oh well, I have a few more I haven’t reviewed yet. Have a marvelous weekend. See you next week. 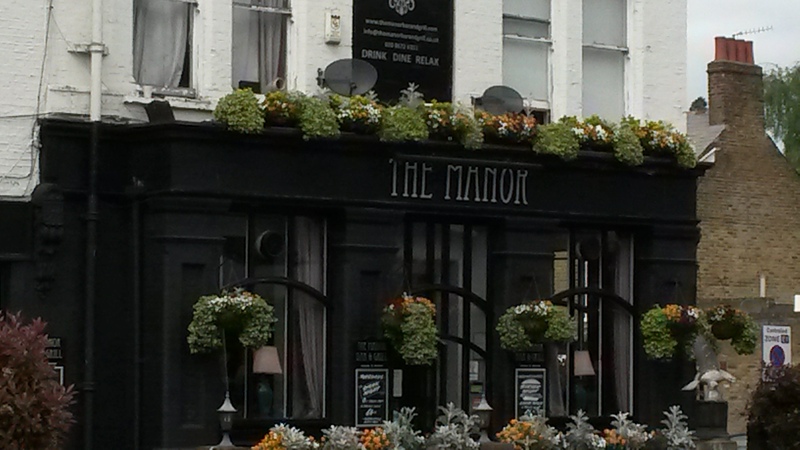 This entry was posted in Pub of the Week and tagged Pub Review, Rebellion IPA, The Manor Bar and Grill, The Marlow Brewery, Tooting. Bookmark the permalink. My favourite part was how you started out with how you “stumbled upon” this place. To my mind, it sounded like you had been to a few pubs before this one LOL!! Those desserts look YUMMY!! Haha! Just teasing you :). It looks like a fabulous place with yummy food. That squid looks pretty good in your picture. Don’t you hate it when you think you have captured a place or thing in a good shot and then when you actually look at it later the pictures just stinks? I think my eyes are getting worse or something these days. At least that is what I am going to believe. Certainly not that I am not a good photographer. 🙂 Have a great weekend! On sunny days, when I snap photos with my phone, I can’t see how they turn out until I get home. And i think you’re a great photographer! My camera phone has suddenly gone haywire and does not take great shots at all which is very frustrating. it doesn’t focus or something. Aaron says I need to do a full restore on my phone and I really am not thrilled with that idea so I keep putting it off….. I don’t even know what a full restore means. I would ignore the situation until I had to buy a new one. Say the word technology and I faint away. You poor dear. Full restore resets everything back to original settings, I think. Which means then you start from scratch unless you have saved everything to the cloud which I am not always so great at doing…. I’ve heard of this cloud … I did that to my laptop once and it wasn’t a good thing. I’m sur you’ll find time for a pint somewhere! We did, at our local pub. You know me so well. If this place were near Milton and me, we’d probably take up residence in it. It looks great! Well if you’re ever in Tooting, you know where to go. That dessert looks scrummy…so glad to hear you got it. It’s hard for me to pass up dessert. I almost expected to see a horse-drawn carriage in the first pic. Any place that sells great chocolate concoctions is a good place in my book. Are those books on the wall or is it just a wallpaper? I actually liked the picture form the outside. Looks like a ice pub. When you see it in person, right now, they have lots of flowers outside and it looks much brighter and cheerier. I never think of dessert when I think of pubs. A nice surprise. Are those real books on the wall or is that wallpaper? It’s wallpaper, but it does give the room a nice feel. oh that dessert looks very yummy! I love it when you stumble upon a new place. Doesn’t happen to me very often anymore, but I suppose that will just make it all the better when it eventually does again. I could go for one of the desserts now with my morning tea. Glad to see you enjoyed this pub, especially since stopping by one hadn’t originally been part of your plans! We happen to hop into a lot of pubs. I love England! More inviting on the outside than in. However, it delivered the goods. Given your US roots, you need to celebrate American Craft Beer Week … and you can do so in absentia with London craft beers. We were able to have some Colorado brews! 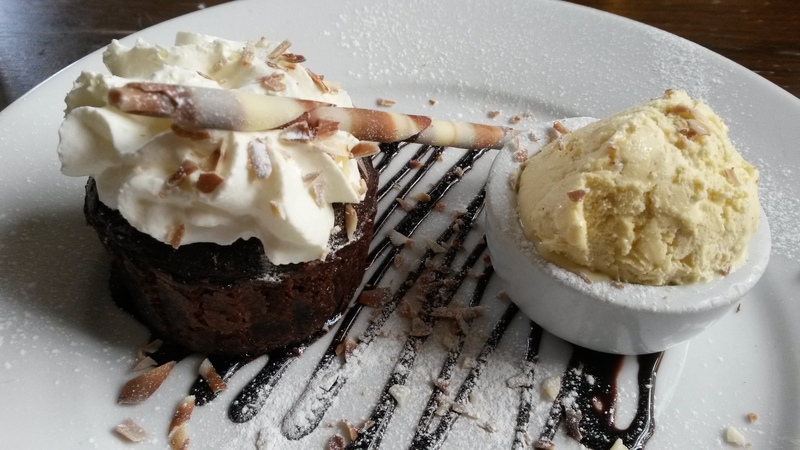 That amazing dessert and that library makes this a fantastic pub… great find! I wish is was an actual library instead of wallpaper, but still a great ambiance. What a cool place. And the food looks good too.